London Mayor Boris Johnson lauds Israeli diversity, and joins President Rivlin for Arab-Jewish friendly match. London's flamboyant Mayor Boris Johnson joined Israeli President Reuven Rivlin for a Jewish-Arab soccer match promoting coexistence in Jerusalem, as part of his tour of Israel to promote investment in London. The pair helped kick off the new soccer season for the "Equalizer" organization, which works with around 140 schools across Israel to build confidence and understanding between Jewish and Arab children. The President and Mayor met with local children and joined in as they held an exhibition friendly match. Before the match, the two conducted a private meeting in which they discussed the importance of coexistence projects - such as Equalizer which was supported by the British Embassy in Israel - and opportunities to deepen cooperation between Israel and the UK. 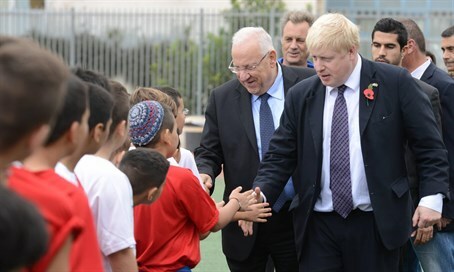 The President and the Mayor of London were then received on the soccer pitch by children aged between 10-12, representing teams from the Jewish school of Geulim, and from the Arab school in Ein Rafa. President Rivlin welcomed the Mayor of London and his delegation, and thanked them for supporting the project. "I am delighted to participate in this initiative, which is supported by the British Embassy, and which works to bring together all the citizens of Israel through sport," Rivlin said. "Today we see young Israelis - Jewish and Muslim children - playing football not just against each other, but together. This is just one example of coexistence between Jews and Arabs in Israel. We are cooperating together in Jaffa, in Akko, in Jerusalem, and across the country. "Such coexistence can be an example for our relations with our neighbors the Palestinians, and the whole region." Mayor Johnson thanked President Rivlin for his warm welcome, and expressed his pride at the opportunity to visit Israel, and especially Jerusalem. "Bringing together young people through sport, teaches them friendship, self-esteem, and how to work as a team, and this is a wonderful thing to see," he noted. The President and the Mayor then kicked off the exhibition match between the mixed sides of Arab and Jewish children – even teaming up to score a goal. Johnson has been outspoken in his support for Israel and has been working to strengthen burgeoning UK-Israel trade relations, which already stand at a record £4.5 billion (roughly $6.9 billion). In Tel Aviv yesterday, the London Mayor dismissed the anti-Israel BDS boycott movement, deriding its supporters as " a bunch of corduroy-jacketed lefty academics."